For over 10,000 years native peoples of the coastal plains of southern Texas returned countless times to a prominent knoll overlooking the lower Guadalupe River not far south of Victoria, Texas. The deep layers of diverse occupational debris found within the knoll suggest that the Morhiss Mound site (41VT1) was a major campsite where prehistoric groups must have stayed during times of seasonal abundance (especially the fall nut harvest) and at other times as they moved up and down the river valley. It also appears to have been a favored locality for woodworking and stone-tool making. Time-sensitive artifacts from the site suggest that it was intermittently and heavily occupied throughout the long Archaic era. There were earlier and later occupations or at least visits as well, with a small amount of Paleoindian materials at the bottom and minor evidence of Late Prehistoric arrow points and pottery at the top along with a few fragments of Spanish Colonial era pottery. The knoll also served as a burial ground for at least 5,000 years, during which well over 200 individuals were interred. 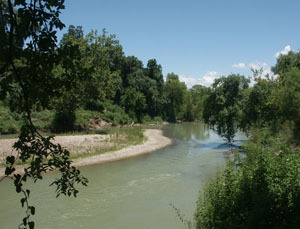 This particular knoll may have been a one-of-a-kind locality, a place perfectly and uniquely situated as a base camp from which those who stopped here could take advantage of the rich natural resources along this stretch of the Guadalupe. The knoll appears to have been safely above all but the biggest floods, but close to many resources for food, shelter, and medicine, as well as a permanent source of water and possibly rapid downstream transportation via simple rafts or dugout canoes. There is clear evidence that those who camped there frequently visited the nearby coast and brought back shells, asphaltum, and, perhaps, fish and other marine resources. Some of the shells were used to make tools while others were fashioned into ornaments and beads, most of which were left as burial offerings. There were also artifact caches and evidence of ritual, music, and ornamentation. All in all, the site was a very special place in the past, and today ranks as one of the most significant archeological sites known from the region. The Guadulupe River near Victoria, about seven miles upstream from Morhiss Mound. Before it was largely cleared in this area for town and farm, the river valley was densely forested. Photo by Steve Black. When the site was first excavated in 1932, archeologists considered the Morhiss Mound to be an artificial construction, an earthen mound purposefully built by piling up basketful after basketful of fill. Morhiss Mound was thought to have been created by prehistoric inhabitants of the area, suggesting that it occupied a heretofore unknown intermediate cultural link between the distant civilizations of Mesoamerica to the south and west and the chiefdoms with large earth mound constructions far to the east in the Mississippi Valley. We surmise that one of the prime reasons that archeologists excavated the Morhiss Mound was to investigate this possibility, which later excavations in 1938-1940 were able to rule out. Rather than an artificial mound, Morhiss proved to be a naturally raised feature (an old floodplain terrace remnant) upon which occupational materials accumulated, thus adding incrementally to the natural topographic relief. Most archeologists today typically do not use the “mound” part of the site’s name because that term is usually taken to mean a purposeful construction. Naturally and culturally mounded accumulation though it may be, the distinctive and evocative name by which it was first known to archeologists has historical precedence. Call it what you will: the Morhiss Mound site, the Morhiss “Mound” site, the Morhiss site, or 41VT1. Although the story includes fanciful speculation, it conveys the findings of the 1932 excavations and the archeological intepretations of the day quite accurately. It is obviously the work of a skilled reporter who interviewed the participants and visted the excavations. Enlarge to see the entire article. We cannot yet tell the full story of the Morhiss Mound site even though it was essentially completely excavated by archeologists from the University of Texas during a preliminary dig of modest scope in 1932 and a large scale excavation in 1938-1940. This was during a time long before the development of the modern techniques of scientific investigation and analysis that archeologists rely on today. The later excavations were well done by the standards of the day, but the fieldwork concluded on the eve of World War II, and the site has never been fully analyzed and properly reported. Fortunately, the collections and documents from the early work are housed at TARL and have proved useful for a variety of completed and ongoing research projects. These curated materials continue to yield clues about the long succession of hunting, gathering, and fishing peoples who lived in the coastal plains. What has been learned so far is quite fascinating and much more can and will be learned by future researchers. Perhaps this exhibit will help spark interest and maybe even the funding needed for sophisticated analyses and full reporting. a relatively wet and warm climate with over 37 inches of annual rainfall and a long 285-day growing season. The lower Guadalupe Valley was once covered by dense woodland forests including major native pecan groves and all sorts of specialized landforms and water features. These include major tributaries such as Coleto Creek, which joins the river just downstream; side channels; oxbow lakes (abandoned river channels); recent terraces; Ice-Age terraces; nearby uplands; and the sparkling, deep-flowing waters of the river itself. Each of these features and interfaces created unique ecological niches supporting varied plant and animal communities. It might have been an itchy, muddy paradise at times, but for peoples who lived off the land, it was an ideal location. Arguably, no substantial subarea of the South Texas Plains comes close to having the resource richness of the lower Guadalupe Valley. More than just the local environs must have figured into the use of site. It was on a natural transportation route, an ever-flowing river that linked the natural regions of central Texas upstream with the downstream river’s terminus—the estuaries and barrier islands of the Texas Coastal Bend. 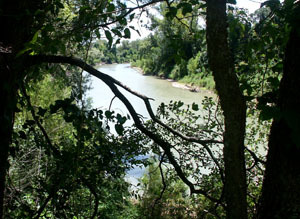 Downstream, the Guadalupe River is united with its biggest tributary, the San Antonio River, just above where the Guadalupe enters the San Antonio Bay system. Morhiss Mound lies roughly 20 miles inland from the northernmost point of San Antonio Bay and about 40 miles from the strandline of the Gulf of Mexico at Matagorda Island. To understand the site, one must also appreciate its time and place in the development of American archeology and the beginnings of federal and state archeological programs. Sites like Morhiss Mound not only give us a window into the ancient human past, but also a look at a transformative period in the development of archeology as a scientific discipline. During the 1930s, the American government had initiated efforts to put America back to work. As part of this effort, the Works Progress Administration was created as part of a federal mandate created by President Franklin D. Roosevelt’s New Deal Program. The principal aim of the WPA was to employ citizens struggling to survive the Depression-era economy and archeology was a good fit, a university-based discipline that could make good use of minimally skilled laborers in many parts of the country. WPA period archeology projects typically employed large numbers of people for periods of time as they excavated one site after another. The sudden availability of lots of labor and the need to keep the work going gave young college-trained archeologists unprecedented opportunities for employment and research. The program’s mandates forced American archeologists to develop more systematic excavation methods and documentation. And they had to produce results that could be quantified so that progress in usefully employing laborers could be demonstrated to the government. For researchers, the outcome of much of this work was the accrual of large archeological collections, field notes, and other documentation. Unfortunately, not long after the fieldwork ended, so did the analysis of what was found. The WPA period of American archeology was typified by delayed production of final reports, delayed laboratory analyses, and a thin record of professional publications. Despite these limitations, WPA archeology provided a wealth of new knowledge pertaining to the archeology of North America that is still being dealt with to this day, as this exhibit attests. 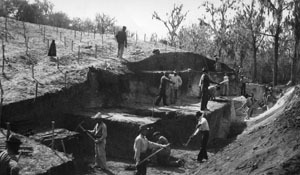 WPA excavations in progress in late 1938 or early 1939. The site was excavated in 5-foot squares dug by “terraces” or 5’ thick arbitrary levels that were followed across the mound, square by square, and dug by pick and shovel until a recognizable hearth feature or burial was encountered. These were exposed by hand and documented individually. TARL Archives. Among the prime resources along the Victoria-Morhiss stretch of the Guadalupe were gravel bars and exposures where suitable tool-making stones could be found. One such gravel bar can be seen here in the Victoria City Park. Photo by Steve Black. 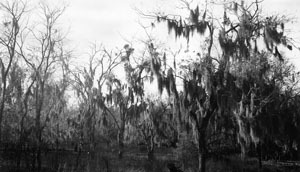 When work began, the Morhiss Mound was covered in dense woodland vegetation including these trees draped with Spanish moss. TARL archives. 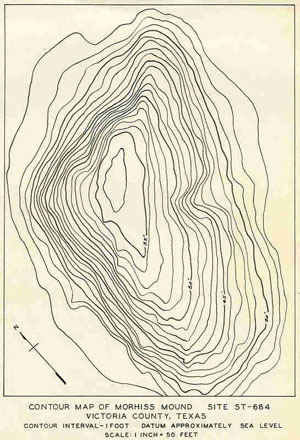 Contour map of the Morhiss Mound site (official WPA designation was site ST-684). This map was made in 1938-1939 by plane-table mapping as the site was cleared and drafted in late 1939. TARL archives.